Just 10 minutes prep time required for this healthy and satisfying vegetable soup! 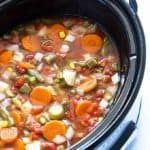 Place all ingredients in your slow cooker insert. Stir well to combine. Cover and cook on low for 5-6 hours, or until potatoes are tender. Discard bay leaves before serving. Garnish with chopped fresh parsley, if desired.